Former politician Rigoberto Tiglao in his column for the Manila Times explained how improper it was for former President Fidel V Ramos to say that the burial of Ferdinand Marcos at the Libingan ng mga Bayani was offensive to soldiers and policemen. “It was an insult, [a]trivialization of the sacrifices of our Armed Forces, PNP, Coast Guard, veterans – retired and active.” Ramos said. Tiglao rebutted this and said that Marcos managed to remain in position for thirteen years because of the AFP and the Philippine Constabulary. Ramos then headed the Philippine Constabulary and was said to be included in the "Rolex twelve" who allegedly planned to execute martial law. He said that while a faction of the military that was headed by Ramos rebelled in 1986, it could not be said that the entire military was against him. When Imee Marcos said that Ramos should also apologize for his abuses, his response was saying that he had atoned for his sins by leading the opposing forces in the EDSA People Power Revolution. 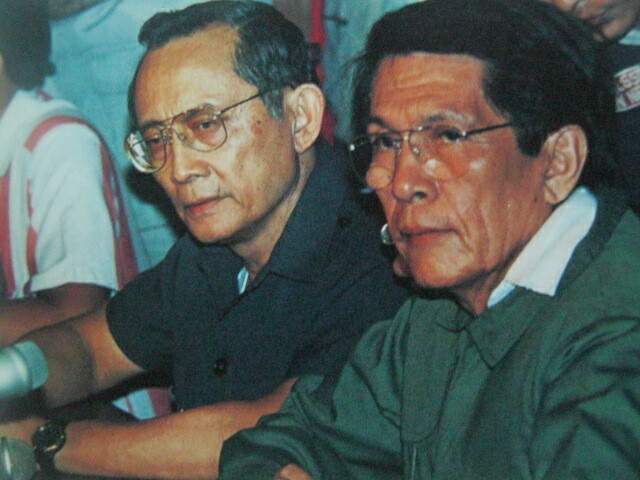 Tiglao said that Ramos' "heroism" was just as valid as the claim that he abandoned his own cousin after realizing that the United States of America was planning to oust him. "For whatever reason though, the real point is that he has not really bothered to explain to the nation whether the accusations of human rights abuses mostly undertaken by the PC, were true or not." Tiglao wrote. He claimed that Ramos' refusal was caused by his political opportunism, as distinguished by him joing Corazon Aquino and her yellow cult. No human rights violations have been against him or then AFP Chief of Staff Romeo Espino. To counter allegations of the military and the police not receiving orders from its leaders about the burial, Ramos respondend by saying that the AFP was not like that during their time and had a "chain of command", where "higher ups knew everything their subordinate were doing". "Isn’t that a confirmation from Ramos himself, that he knew about the human rights abuses committed by the PC during martial law, and that he had command responsibility over the PC units accused of these crimes?" Tiglao wrote. Ramos had an agreement with the Marcos family then to let the dictator's remains be flown back to the country but only if it will be buried at Ilocos Norte, he therefore called the family "cheats". Tiglao however said that while the family had an agreement with the president then, they have every right to make an agreement with the president now. "Marcos’ burial at the Libingan where three other presidents of the Republic lie, shatters the narrative of an evil, ruthless dictator that ruled the country who killed “thousands of Filipinos.” And with that fiction unraveled, thrown to the garbage are the self-righteousness of the Yellow Cult, the mythology of Cory Aquino as Philippine democracy’s saint, and the legitimacy of the Communist Party as the vanguard party that fought a ruthless dictator." Tiglao wrote. He said this is the reason why the yellows are enraged by the burial. "That is the reason why the Yellows and the Reds have been apoplectic over the burial. If Marcos’ demonization ends, which will happen if his remains are buried at the Libingan, who would be blamed for the human rights abuses during martial law?" "How could we have missed that Ramos, after all, has been a pillar, the hidden High Priest of the Yellow Cult?" he wrote.